The world is currently facing a real and imminent threat In Japan, at the site of the Fukushima Daiichi nuclear power plant. The Japanese government has plans to relocate four thousand tons of spent nuclear fuel, highly toxic and irradiated. There is 14,000 times the level of toxicity in this fuel than radiation that was released in the Hiroshima nuclear explosion. The scale of this operation is something that has never been undertaken by humanity. Moving this much dangerous material, especially in as degraded of a form as it is in – and from a degraded building – is going to require nothing short of a miracle to be done properly. If it is not done properly, and something goes wrong, the risk of explosion, and therefore toxic exposure, is incredibly high. Should this happen, it is estimated that much of the northern hemisphere may be exposed to lethal radiation for thousands of years – or something maybe even worse. This may be a most serious crisis ever facing humanity, and it may be happening in the next couple of months. The astrology will certainly show this. 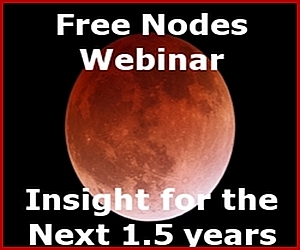 We are headed toward a very intense eclipse on November 3, 2013. At that time, the sun will be eclipsed by Rahu, the North node. It will also be joined Saturn, the moon, and Mercury retrograde. Saturn will be at its highest exultation point, which by default should be seen as a stabilizing influence. Yet, Saturn is the planet of death and danger as well as consequences,.. gulp! The sun is debilitated, showing “the power” itself is weak. Rahu, the North node has to do with nuclear energy and radiation. 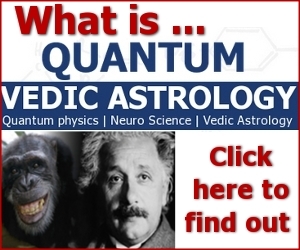 Why you ask?, Because Rahu wants to eclipse the sun – The source of all energy. Nuclear energy is just an accelerated and potentially lethal substitute for the sun’s natural energy. All power comes from the sun. Not just power in the form of electricity, oil, etc. – but also the power in our bodies. The power in food that we eat is nothing but sunlight. The sun itself is a nuclear reactor, turning hydrogen and helium. 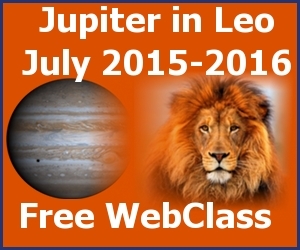 In addition to these eclipse factors, we should consider the outer planets that are used in Western astrology. In particular, a couple of days before the eclipse, a square between Pluto and retrograde Uranus perfects to the exact degree. 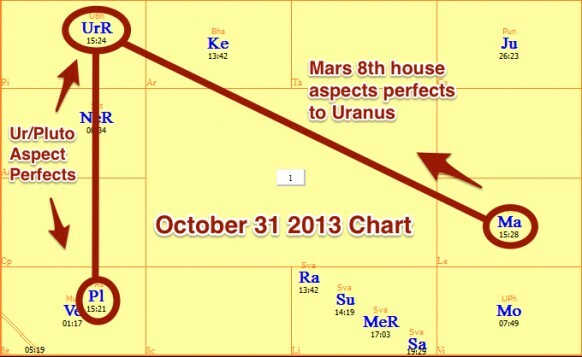 In addition, Mars casts a direct eighth house aspect on Uranus that same day (October 31, Halloween). According to this astrologer, the outer planets do indeed have affects, mostly on a cultural or internal level. But their external results are usually seen when associating with a visible planet. With Mars casting a one-way aspect on to Uranus, on October 31, it is my hope this will ignite creativity and “outside of the box thinking”, one of the most important traits of Uranus – and Rahu. We are entering a phase where the overlooked tragedy of this nuclear disaster is now going to enter mass consciousness. 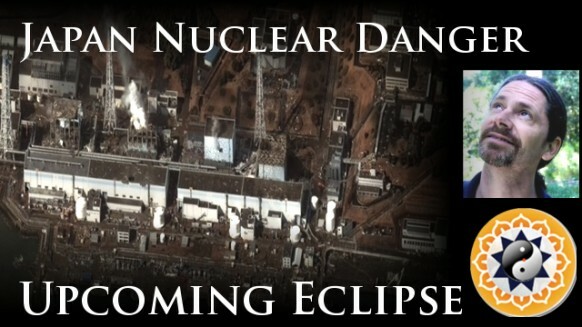 I see this as being indicated by this Uranus/Pluto dance – which has been happening since the nuclear disaster began. 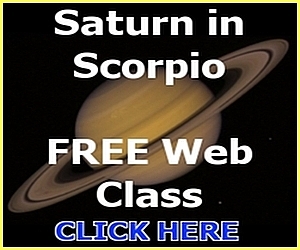 When the Tsunami hit originally, Mars was in a very tight aspect to Saturn, an eighth house aspect. This is the same aspect that we now see in Mars tightly applying to Uranus. What was interesting about the initial tsunami/Mars aspect is there were no explosions after Mars separated from the aspect with Saturn. Before that, there was this tsunami/earthquake and buildings exploding. This is classic Mars, putting a one-way aspect onto another planet. Thanks, Sam! This video was entirely unexpected but so timely. It makes me wonder what the USA chart as well as the Japan chart would show for this coming new moon. Since Pluto is in the US first, Uranus in the 4th, and Mars in our 9th, the stellium of Merc, Sun, Moon, Sat, and Rahu would be in our 11th, but I don't remember what natals this will effect nor do I recall which Dasa we will be in, let alone what will be Japans. 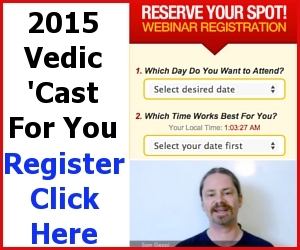 It sounds like a great lesson for Vedic students, though. Japan has been one of our best allies since the great war, so it would be nice to see how this will effect interaction between the two. Any hope of a chart comparison of these two?